What Is The Most Optimum Way To Implement Your Mobile Strategy? Enterprise mobility is making a remarkable impact on the bottom line of many businesses. Mobile apps form an integral part of any enterprise mobility strategy. But what is the best way to get started? Is it wise to develop the apps in-house or buy them from a vendor? Is outsourcing or a project-based scenario a good enough option? What is the best way to capitalize on your enterprise mobility strategy with a long term vision? 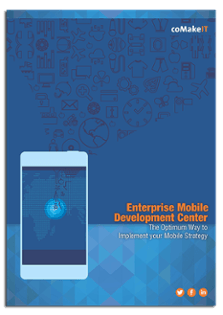 Check out the possibilities of making your mobile strategy a success with our guide on Enterprise Mobility and the advantages of setting up an Enterprise Mobile Development Center.